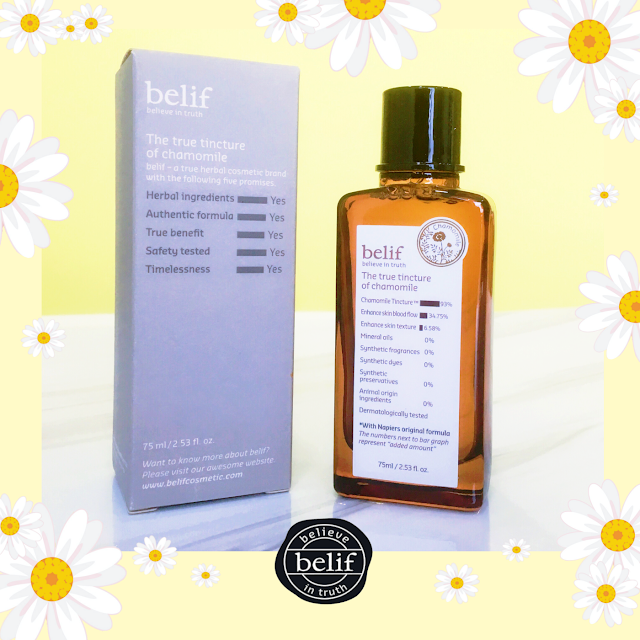 Today I'm going to talk about Belif's The True Tincture of Chamomile which I've started using since November last year. Actually, I'm still halfway using it but I think now it's about the perfect time for me to share about this product. To be honest, I've been eyeing for this baby for quite sometimes but it took me awhile before I actually made up my mind to purchase it; mainly because the price tag is not something that I would usually invest in for a single item. I've read mixed reviews about this one so I was a bit hesitant at first especially since my skin can be pretty sensitive at times. I guess my curiosity won over my rationality but for once I'm actually thankful that I took a leap of faith to try this. First of all, can we take a minute to admire the packaging? I am super in love with the aesthetic of it, especially the feeling of heavy 'apothecary' glass bottle in my hand. Comes in 75ml in volume, I managed to purchase it via Althea website for a slightly lower price; only RM178 (retails at RM190 in Belif Malaysia stores). 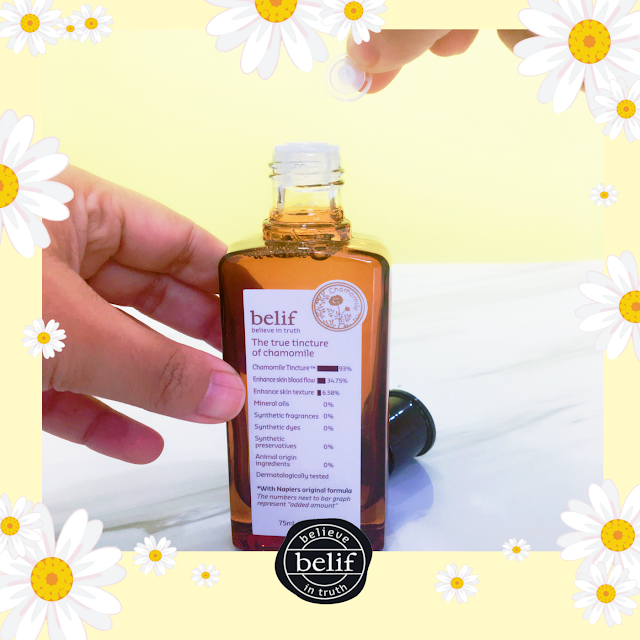 Like other Belif products, the packaging comes with complete information that would be needed by the users, for example; the full ingredient lists, and usage instruction. What is a tincture of chamomile? Tincture method is a traditional herb extracting technique that is used by herbalist to produce concentrated herbal liquid. Instead of using water for dilution, alcohol will be used to macerate the chamomile. This is a folk method of extraction which has been used by herbalist for a long time and it is said to produce more potent extract since alcohol (eg: ethanol) is known to be a better solvent than water. Looking at the ingredient list of the Belif True Tincture of Chamomile, I'm guessing that a plant-based glycerin is used as one of the solvents since this product doesn't use any animal origin ingredients. 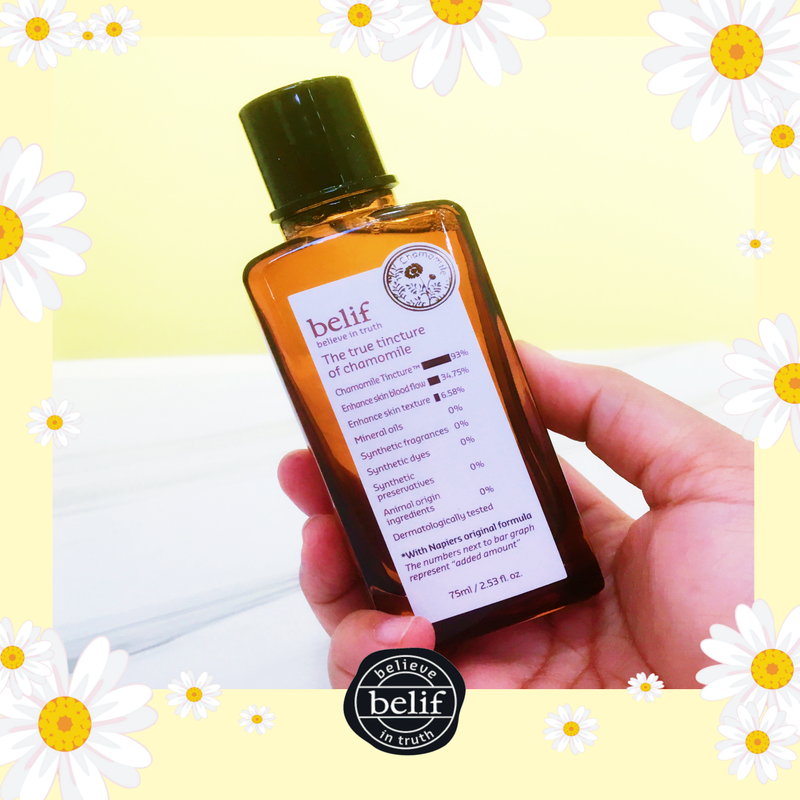 The whole 75ml bottle is said to carry 93% of Belif's Chamomile Tincture so you are getting what you are paying for. 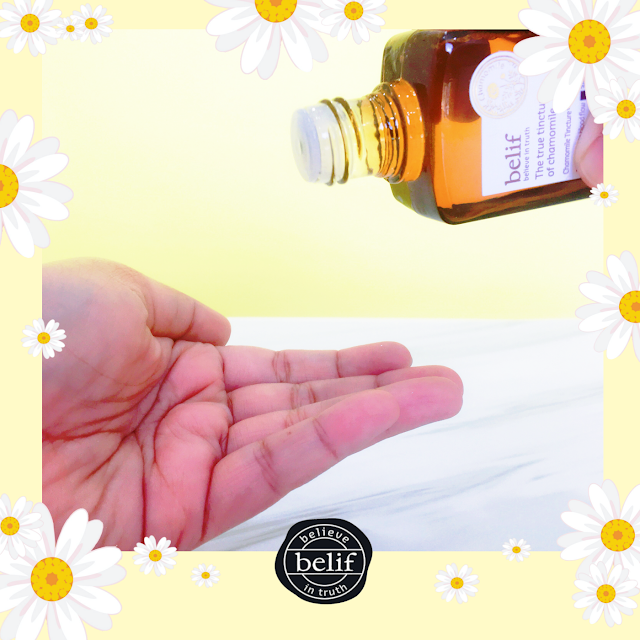 Chamomile is known to be a great anti-inflammatory agent which helps to soothe sensitive or acne-prone skin and subsequently help reduce redness as well. It is also said to have anti-ageing properties and the ability to treat sunburn. A great conditioner, it also helps to reduce flakiness on a dry skin while providing enough moisture for a soft and bouncy skin. On top of that, it also has the ability to get rid of the skin dullness as well! Basically an essence, you are advised to use this product after toner. It has a pretty light texture, almost runny but when applied directly to my dry skin, a slight tackiness can be felt afterwards. It doesn't last long though since it got absorbed pretty fast. Dermatologically tested and clinically proven, Belif True Tincture of Chamomile helps to increase the skin blood flow by 34.75% (after 4 weeks) and improves skin texture by 6.58% (after 2 weeks). Despite this being an alcohol-based product, my dry skin doesn't suffer from over-drying; as a matter of fact, it becomes visibly more soft, less flaky, plump and brighter after applications. I also noticed that the redness on my skin tends to subdue a little afterwards as well. Scent-wise, I think it has a slightly stronger scent than most skincare but I actually love its herbal smell which is not common because usually, I don't like overly strong smell in my skincare products. Don't take my opinion wholeheartedly on this one though as I have a quite keen sense of smell. I asked Eros from fishmeatdie.com and he thinks it smells fine and not that strong so I guess it's all a matter of preference. Chamomilla Recutita (Matricaria) Flower Extract (86%), 1,2-Hexanediol, Glycerin, Beta-Glucan, Panthenol, Glycereth-26, Centella Asiatica Extract, Avena Sativa (Oat) Kernel Extract*, Calendula Officinalis Flower Extract*, Nepeta Cataria Extract*, Rubus Idaeus (Raspberry) Leaf Extract*, Baptisia Tinctoria Root Extract*, Stellaria Media (Chickweed) Extract*, Saccharomyces/Imperata Cylindrica Root Ferment Extract, Saccharomyces/Viscum Album (Mistletoe) Ferment Extract, Lactobacillus/Soybean Ferment Extract, Alcohol, Water, Glucosyl Hesperidin, Polydatin, Niacinamide, Trisodium EDTA, PEG-8, Dipotassium Glycyrrhizate, Alanyl Glutamine, PEG-150, Sodium Hyaluronate, Ethylhexylglycerin, PEG-60 Hydrogenated Castor Oil, Sodium Citrate, Citric Acid, Fragrance+, Citral, Cintronnellol, Limonene, Geraniol, Linalool. 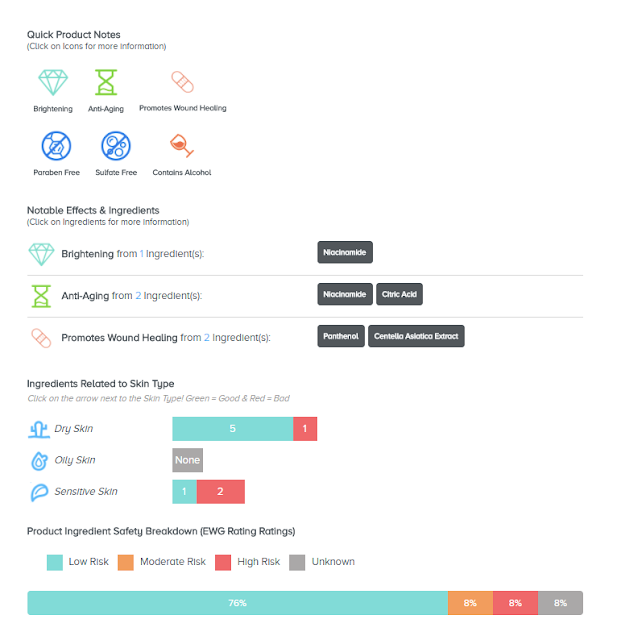 Niacinamide | Brightening and anti-ageing. Panthenol | Promotes wound healing, good for dry skin. Cantella Asiatica Extract | Promotes wound healing. Glucosyl Hesperidin | Stimulate blood circulation, reduce dullness. 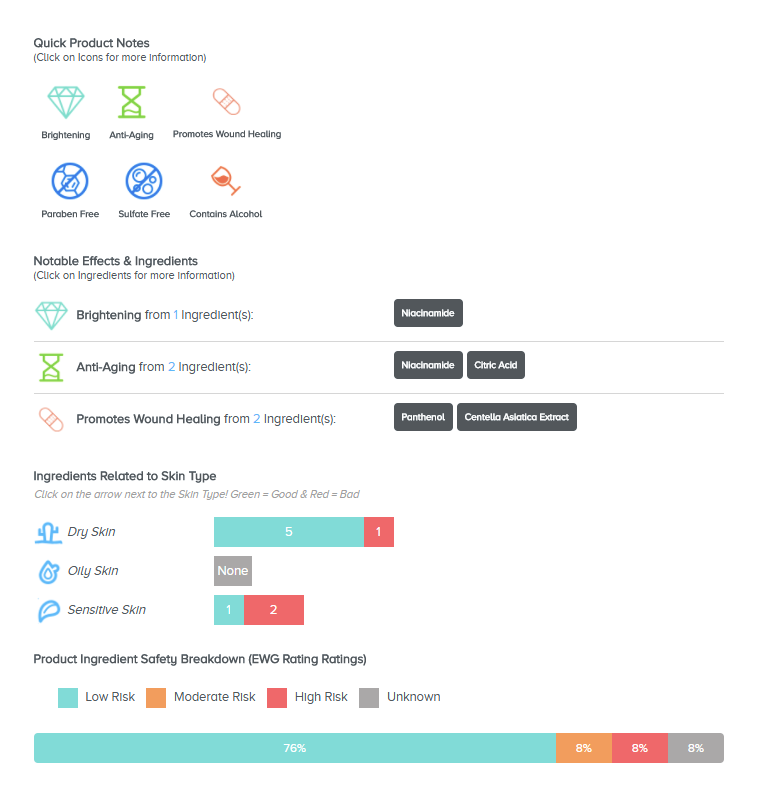 Sodium Hyaluronate | Good for dry skin. Apply evenly to face and neck, after cleansing and toning. Use daily, morning and evening. You can choose to apply it using cotton pads or pouring it straight into your palms. I prefer to use the latter, followed by patting motions. Been wanting to try this as well but the price tag puts me off, and I decided to go with the Aqua Bomb instead, but I'm conflicted again 'cause it contains the 2 ingredients I love which are Niacinamide and Cantella. Although seeing the rest of the ingredients, I wonder if it will suit my oily skin. Its really expensive. I didn't know how I ended up buying it LOL but really nice to the skin, I am in love. I've never tried the Aqua Bomb but I want to try it next! Hi, I'm glad you like the post :) Thank you fro dropping by on humble blog!